Da niel Defoe is one of the major literary figures who have lived in Thurrock. In 2014, James Canton spoke to a society meeting about his book, OUT OF ESSEX Re-Imagining a Literary Landscape (Signal Books, 2013). 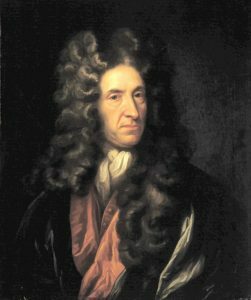 In chapter 7 of the book he describes his search for Daniel Defoe. He met Jonathan Catton and Randal Bingley (who are both greatly missed) in the World’s End pub. Randal had identified the site of the house built by Defoe (Panorama 27). Although not named, this can be seen on the Chapman & Andre map of Essex in the Tilbury marshes in the parish of Chadwell. Randal took Canton to a site where he could see the remnants of the drainage sewer that had served the house and tile works. In his search for Defoe, Canton also contacted John Martin, a Defoe biographer (The Man That Never Was, APF Ltd, 2013). Martin had also been shown the drainage sewer by Randal. Martin believes that Defoe was born in 1644 and that his mother Ellen was related to Edward Lawrence who owned the Gobions Manor in East Tilbury. According to Martin, Defoe was educated there in the period 1658-1662 and lived there with his brother Thomas for some ten years to 1705. Randal took us to East Tilbury where we were able to inspect the former site of the manor house. Martin’s biography has not been well received by some reviewers. According to Sheldon Rogers of the University of Portsmouth, Martin’s biography “is … tainted by fiction, inaccuracies, and an unreliable chain-forging of evidence”. Whatever the details, there is no doubt that Defoe lived in Tilbury and built a house there. However, there is no Thurrock Heritage Plaque to mark this association. Does Defoe deserve a plaque, and if so where should it be placed? This entry was posted in Chadwell, Marshland, Tilbury Town on July 1, 2017 by rjm.